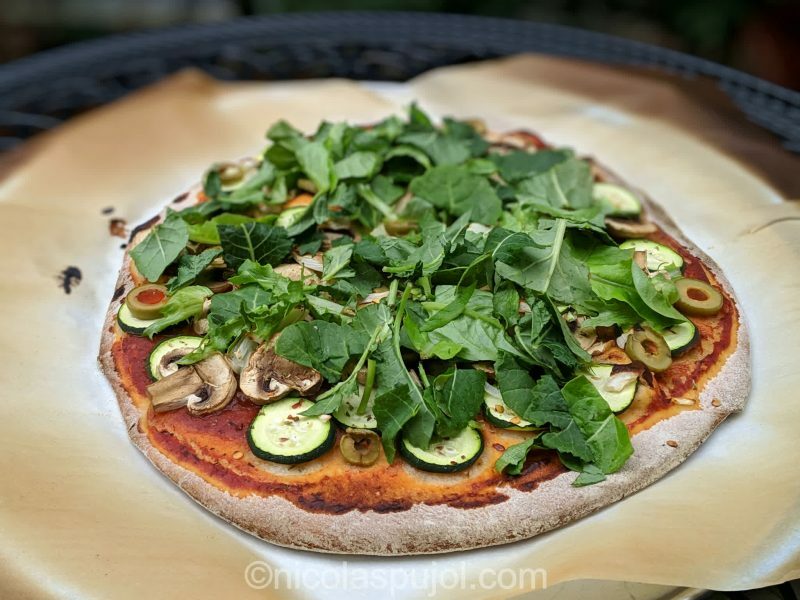 Who said pizza has to be full of dairy and fat? 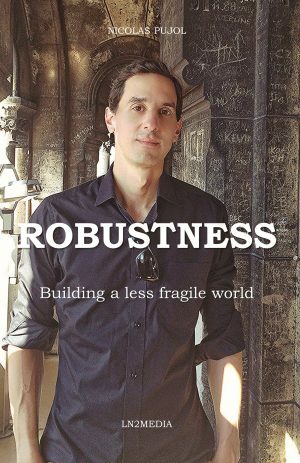 There are customs and beliefs, or simply habits which repeat themselves to make a civilization. As the environment evolves, new civilizations emerge, or those which already exist can also evolve. 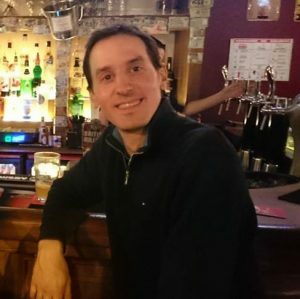 Essayist Aymeric Caron made this very point during a debate on plant-based nutrition, and I find it to be true. A civilization can evolve. 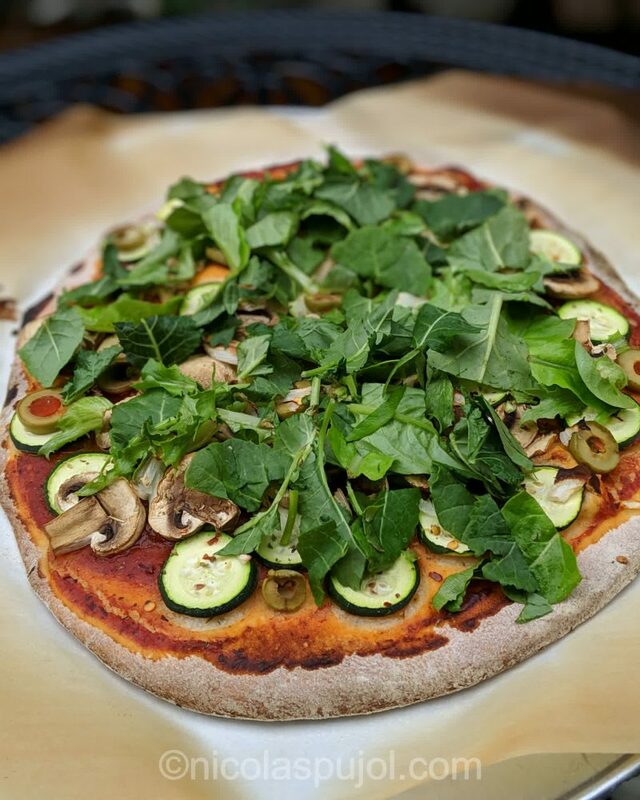 In big steps, with plant-based nutrition, and in small steps along with the way, with the oil-free, dairy-free and meat-free pizzas. 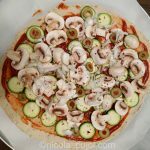 This mushroom zucchini and baby kale vegan pizza (oil-free) tastes absolutely delightful, especially with a side of balsamic vinegar and hot sauce. Like many recipes, cooking at home can be time consuming and complicated. Or it can be quick, simple, and meet your nutritional goals because you know the ingredients which go into your food. 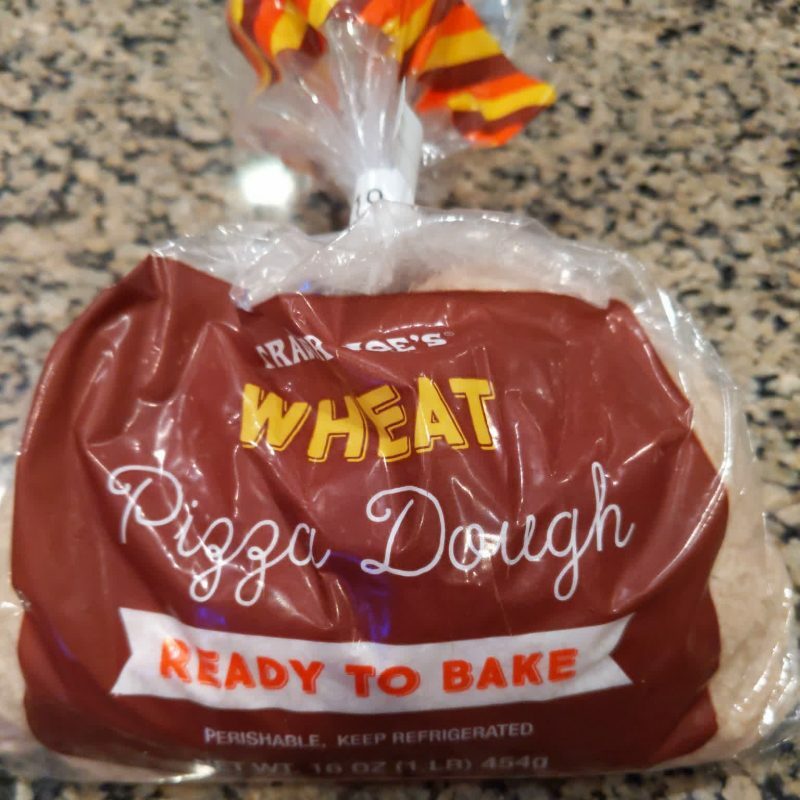 I am taking a shortcut here by choosing a good quality whole wheat pizza dough from Trader Joe’s. You can find one near you that is either fresh like this one, or frozen. Read the ingredients at the back to make sure there isn’t anything you don’t want too much of. 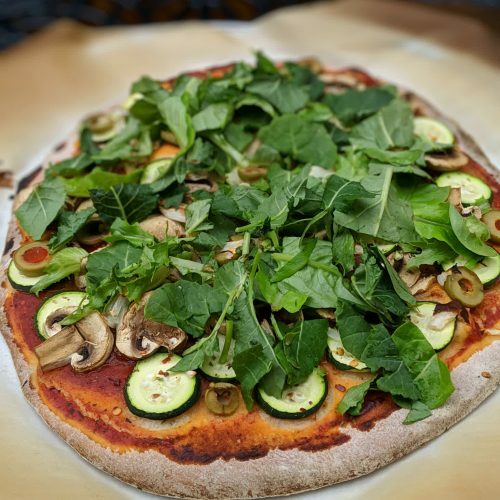 For the rest of the ingredients for this mushroom zucchini and baby kale vegan pizza , I picked a tomato sauce which contained not too much salt, and of course no dairy. 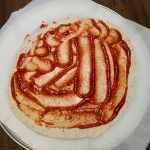 I was at a restaurant a month ago, trying to customize a pizza order to be vegan, and the waiter told me that the only option they had for tomato paste already had some parmesan in it. The US has a long way to go to get rid of this animal product eating habit, but given enough time, everything that has to happen, happens. That’s why cooking at home is such a privilege. You pick what goes into the dish in a way no restaurant can. In addition to a tomato base, I added mushrooms, zucchini, onion, garlic, and a touch of dry oregano before baking. I wanted the baby kale to stay intact, or it would come out dry and brown, so I added it after taking the pizza out of the oven. 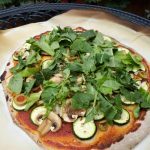 As a substitute for oil on pizza, given the vegetable toppings, balsamic vinegar provides a very compatible flavor and alternative. One of the reasons people use oil is that it traps moisture and keeps the food from drying out. 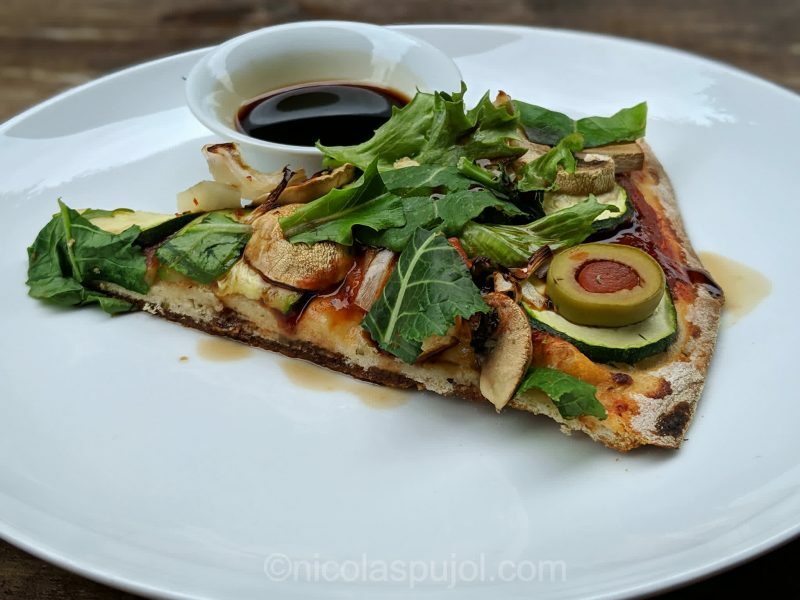 Adding balsamic vinegar after baking gives the pizza a similar benefit, and it does not contain any fat in it. Finally, I added hot sauce (Tabasco, Sriracha etc) to each slice to give the flavor an extra kick. Who doesn’t like spice on a pizza slice? Do you want even more spice? 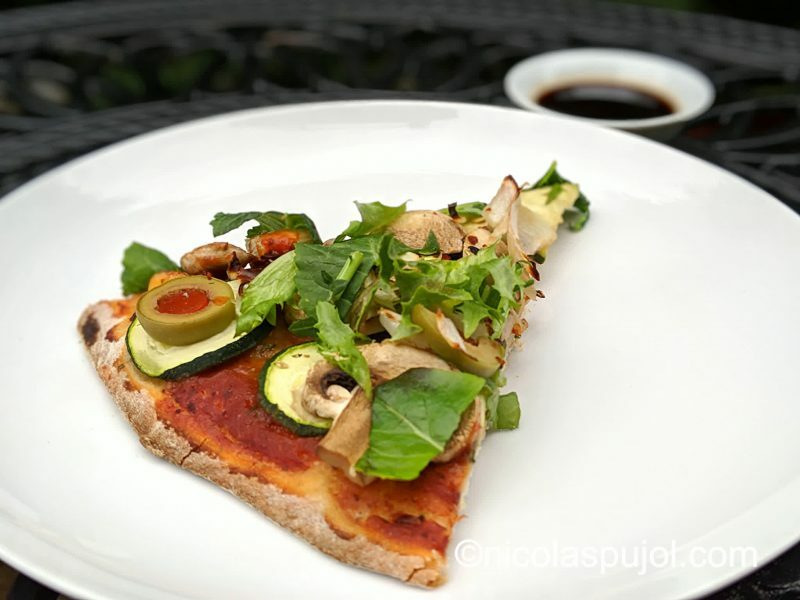 Check out the sister recipe, vegan BBQ pizza with eggplant and bell peppers. 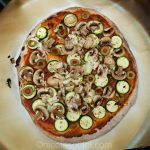 This mushroom zucchini and baby kale vegan pizza (oil-free) tastes absolutely delightful with dry oregano, a side of balsamic vinegar and hot sauce. 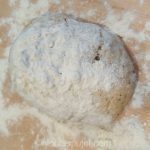 Put a little bit of flour on the dough to prevent it from sticking and roll it several times in different angles to flatten it. Spread the tomato sauce evenly. Rinse and slice the mushrooms, zucchini, then chop finely some garlic and onion and add them all on top of the tomato sauce. Sprinkle dry oregano and place the pizza in the oven. Bake for 15-20 minutes, checking frequently to make sure it is cooking enough and not burning. If needed, reduce the heat to 400 F.
Remove pizza from oven when fully cooked. 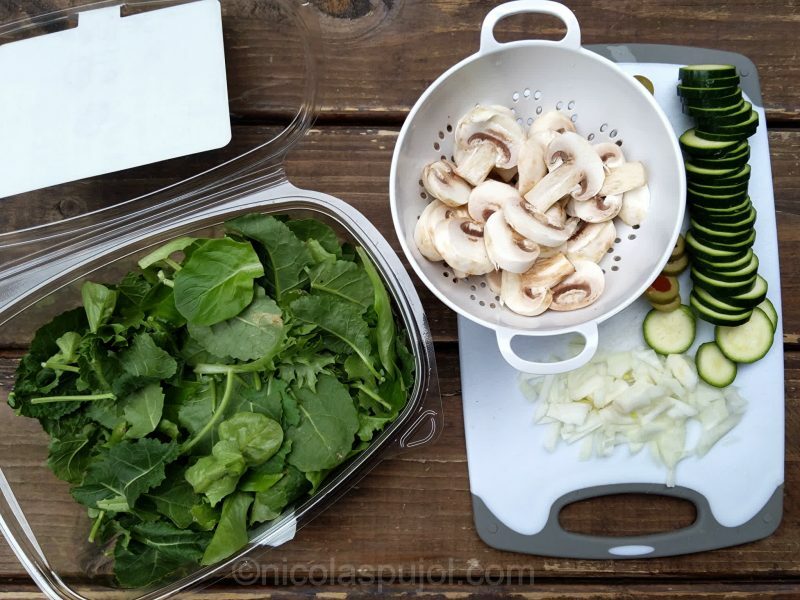 Chop the baby kale and spread it on top. Each person can add balsamic vinegar and hot sauce to their liking on top on their plate.